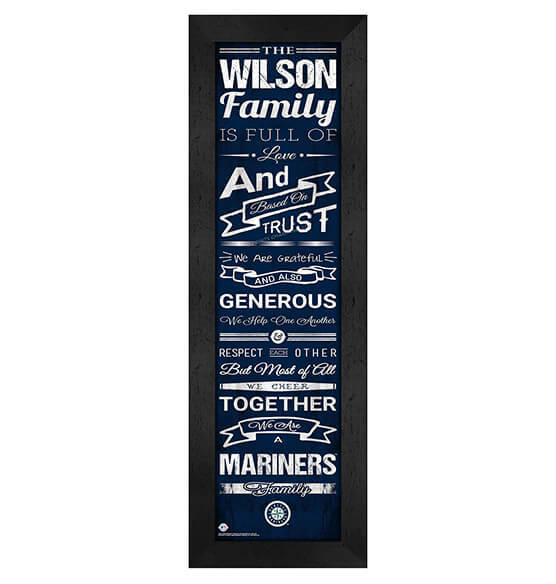 Cherish your love of this iconic all-American game as well as your love of family with our premium Personalized Family Cheer Seattle Mariners Wall Art from PersonalizedThings by Exposures! This glass-framed, vertical hanging piece of art features space for your family's name above special sayings in vintage-style script to signify the strength of your family's bond. Printed in vibrant Seattle Mariners team colors and the team's logo, our easy-to-hang personalized art piece is guaranteed to bring a smile to your face. Purchase for yourself or as a quality gift that family, friends or co-workers will cherish forever.